Humber College officials met with their Lakeshore Campus neighbours this week to discuss long-term revitalization plans to accommodate their ever-growing student population - including the construction of a Welcome Centre and a new 150,000-sq. ft. building. Of Humber's current slate of 25,000 full-time students, 7,000 are currently attending the Lakeshore Campus and those numbers are only expected to increase in the years to come, said Humber president John Davies. "We're a growing, popular college...but of course that creates pressures for us to provide increased capacity, and that's why we're here tonight: to look at the pressures we have at Lakeshore Campus and to share with you some of our plans," Davies told a standing-room-only crowd at a community consultation meeting Wednesday, Nov. 16. Davies estimated the student population at the Lakeshore Campus will eventually cap out at 10,000 - a 3,000-pupil increase from their current numbers - because "there isn't really any space in this area for much more than that." "We are absolutely aware that we have a certain amount of land to work with and that we have a community that we have to be a part of," he added. In recent years, Humber officials have made creative use of the limited land and property they have available to them in and around the campus, repurposing many a building north of Lake Shore Boulevard West to suit their needs (see sidebar for examples). 1. 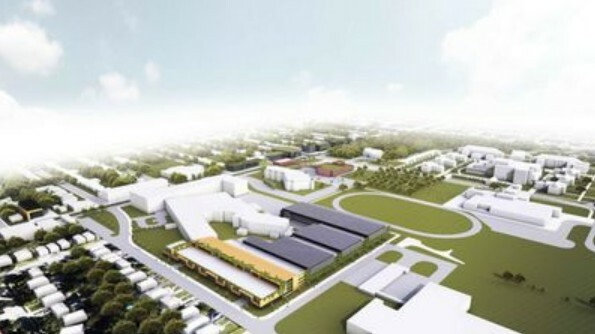 Post-2014, Humber plans to build a 150,000 sq. ft. building along the south end of Twenty-Third Street, developing the building so there's a two-storey street edge, stepping back to an additional three storeys. Also proposed is a multi-decked parking garage on the site, increasing parking from 650 to 1,500 parking spaces. The parking deck and new building would be accessed from Lake Shore Boulevard West at Twentieth Street. 2. Proposed plans for a Welcome Centre along Colonel Samuel Smith Park Drive (on the northwest corner at Lake Shore Boulevard West) are still "very conceptual" at this point, Valens said, but also very necessary. The plan is to develop the centre with short-term underground parking, which would allow visitors "to arrive, find out what the campus is all about, and basically find out where they need to go," Valens said, noting that the facility would also eventually house registration, test centres and counselling. 3. Humber recently acquired Wildside Motorcycles, 3246 Lake Shore Blvd. W., for the purpose of developing a fitness facility featuring aerobic and weight room studios. While the college has not started designing it yet, Valens said it's expected the new facilities will "provide a greatly needed increase for student facilities, as well as access for the community." 4. Building G is the last of the heritage cottages to be restored and renovated. Humber is currently looking for ministry and/or partner funding for this 8,000 sq. ft. facility. 5. Humber recently renovated a portion of the second floor of its Community Medical Services Building at 3170 Lake Shore Blvd. W. for use as an early childhood education facility. The plan is to maintain the existing pharmacy and doctors' and dentists' offices on the main floor, while using the second and third floors for Humber faculty offices. 6. Toronto's Catholic school board is set to build a replacement school for the aging Christ the King Catholic School along Colonel Samuel Smith Park Drive, just south of the proposed Welcome Centre. The 530-pupil school is expected to be about 55,000 sq. ft. Reaction to the proposed plans at Wednesday night's meeting was mixed, with many in attendance applauding the college for its efforts, while simultaneously expressing concerns over parking pressures, traffic increases and the loss of green space the projects were thought likely to bring. Brian Bailey, president of Citizens Concerned About The Future Of The Etobicoke Waterfront (CCFEW) has lived 100 metres from the entrance to the college at Twenty-Third Street for 16 years. He said plans to change access to the college parking lot to Twentieth Street would cause traffic headaches for all. "You'll have to put a traffic light in, which means you're going to have three lights within very short distance of each other at Kipling, Twentieth and Twenty-Third streets," he lamented. "I would avoid Lake Shore like the plague if there's one more traffic light put in." Meanwhile, calling Humber College an "asset to the community", longtime community activist Ruth Grier expressed her hope that Humber's expansion might improve transit in the neighbourhood. "If your advocacy with the TTC can do something, it would be greatly appreciated by everyone in the community," she said to applause from the crowd. "We've been trying a very long time...to get a streetcar starting at Long Branch, going to Humber, then up Roncesvalles to meet the subway." Putting traffic lights at 20th St will run traffic down 19th St and especially 20th St. Humber must ensure that their expansion does not infringe on the right to a decent neighbourhood of the people who live nearby. As well, Humber wants to 'brand' both sides of the Lakeshore from 13th St to 23rd St. Sorry, but this is Lake Shore Blvd West, in the historic village of New Toronto. We are not an extension of their campus. It is time they learned to be good neighbours.